We've gathered and shared travel content from around the web. As always, you can follow us on Instagram, Facebook, Twitter, & Pinterest to get this news when we first post it. A lot of people don't know this, but Helen is actually the third most-visited town in Georgia, only beat out by Atlanta and Savannah. That's pretty good for the best little German town in America with a population of only 543 people! However, Helen wasn't always known for its German roots. The area has known plenty of ups and downs since its settlement, from the beginnings of American colonization, all the way to the present day. Let’s take a deep dive and find out what makes Helen Georgia so special, the journey through history, and a brief survey of things to do in the area. 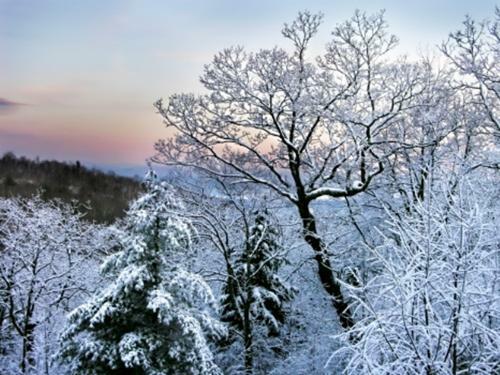 Click here to check out the weather, and expected seasonal conditions. The town of Helen has a unique history among the many mountain towns set among the Appalachian foothills. Helen also has deep Native American roots, a rich history as a logging town and is now known for its Bavarian style and culture. Exploring the town and the surrounding area gives you a glimpse into this town's rich history. Like most of northern Georgia, Helen was home to the Cherokee nation prior to the arrival of European settlers in the 1800’s. You can still feel the Cherokee influence today in place names and other historical sites like the Track Rock Gap petroglyph site. For many years, settlers and the Cherokees worked together. In 1813, the Cherokee Nation approved the construction of the Unicoi Turnpike, a wagon road through their territory leading from the Savannah River headwaters northeast into Tennessee. Highways 17 and 75 now sit where the old road used to be. Sadly, the Cherokee nation was forcibly displaced later that century with some limited influence in the present day. Shortly after, Gold became a transformational force. 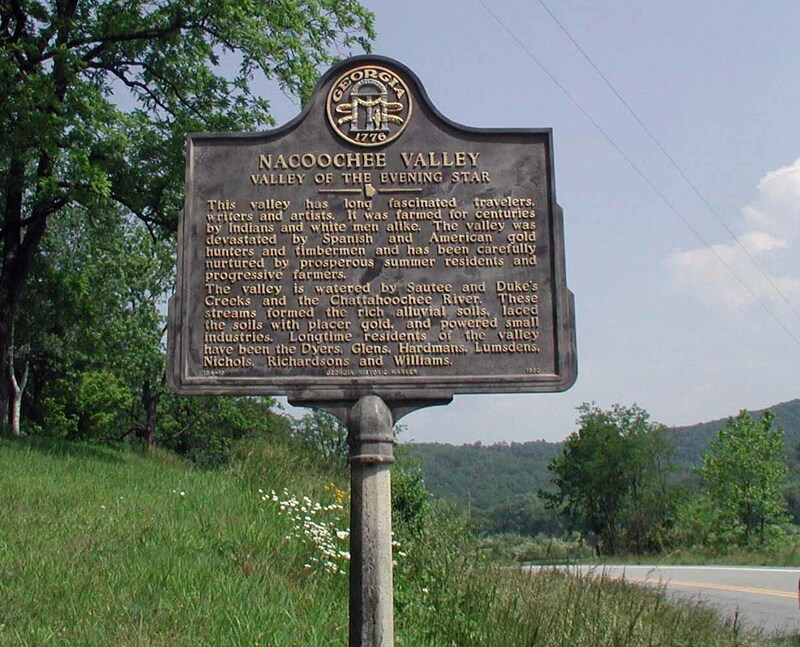 America’s first gold rush didn't start in California, it started in 1828 when gold was discovered in the Nacoochee-Helen Valley (5 miles southeast of Helen Georgia). Miners worked the land extensively including the current site of the historic England Gold Mine, the site of Helen's current gold mine. With the discovery of gold in the Nacoochee Valley the resulting less-well-known Georgia Gold Rush brought a huge rush of settlers and opportunists, who quickly established towns and settlements across the area. Prospectors worked the hills around Georgia for nearly a century in the pursuit of this precious metal. The gold rush ended when miners hightailed it west leaving Helen to fend for itself. While that gold boom died off relatively quickly, the area that would become Helen lived on as a mining center throughout the Civil War. While relatively untouched by the war itself, the Helen area fell into anarchy during The Reconstruction, until rediscovering itself as a forestry center at the end of the 19th Century. Sawmills rose up and the railroad came to town as well. Helen itself came into being in 1913, named for the daughter of a railroad surveyor looking to bring more rail lines into the area. For the next several decades, Helen operated as a dedicated logging town. The logging industry kept Helen at the center of commerce in Georgia with the Matthews Lumber Company sawmill leading the boom. But by the 1930s, the timber company and the sawmill abandoned the town of Helen and residents left for other opportunities. Helen might have folded, except the Federal government created the Chattahoochee National Forest, bringing both tourism and additional lumber opportunities to Helen through the 1950s. In the late 50s and into the 60s, Helen went into a new decline. There was less demand for lumber with the rise of plastics, and tourism was dropping off as well. Facing a town in trouble, civic leaders conceived of an audacious plan that turned Helen into the beautiful attraction we love today. Not enough to stop potential economic ruin, town leaders got together in 1968 and proposed turning their town into a recreation of a Bavarian alpine village complete with gingerbread trim, cobblestone alleyways, and old-world towers. It would become a destination city, and one now famously known. The Two major local businessmen - Pete Hodkinson and Jimmy Wilkins - found a way to uplift their town after hearing of a nearby town finding success by renovating and updating their downtown storefronts. Hodkinson and Wilkins took it a step further by hiring a local artist, John Kollack, who had German roots and had spent quite a bit of time in Bavaria. His mission? To redesign the entire town to resemble that of an Alpine mountain town, bringing the Alps to the Appalachians. Given the strong influence of German settlers on the history of the area, it was a natural fit. The revamp brought a facelift to the entire town. Besides agreeing on a common color scheme for Helen and basing the new store facades around it, the revamp extended even to the street names, changed to mirror common streets found in Germany. Practically overnight, Helen became the best little German town in America, from the stores to the cobblestones. The experiment was a near-immediate success. By 1972, the reinvention of Helen had already significantly boosted its tourist revenues, and in 1976, the Federal government was sending economic experts to study Helen's amazingly rapid revitalization. The Helen of today harkens back to a much earlier time and celebrates its new Bavarian heritage with several German and alpine-inspired festivals each year. From 1972 onwards, Oktoberfest (which runs from September through October) has been an annual tradition in Helen, creating one of the best celebrations of German culture anywhere in America. 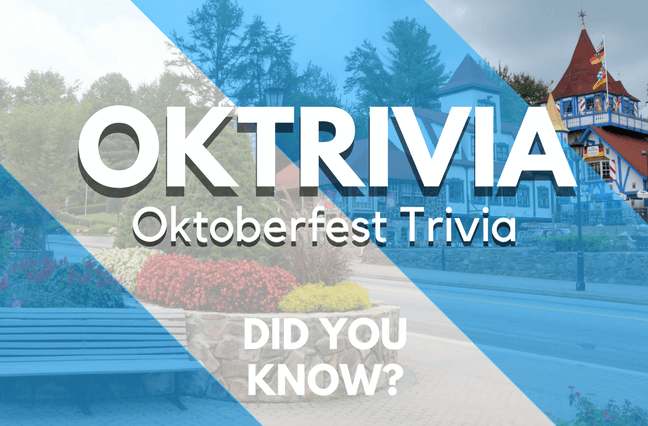 In fact, Oktoberfest in Helen is the longest in the nation, running for nearly six weeks from mid-September to the end of October. It's beer, brats, drinking songs, polkas, and all the lederhosen you could ask for! Millions of people come and enjoy the unique experience that Helen presents - the beauty and charm of an authentic Alpine mountain town, nestled among America's most beautiful peaks alongside the historic Chattahoochee River. Helen attracts some the brightest from Germany and elsewhere across the Alps, with a number of Master Chefs relocating to the area to open their own authentic restaurants. Locations like the Haubrauhaus or the Bodensee bring Helen authentic cuisine that can only be found in a few other places this side of Europe. Helen really is the best little German town in America, and we're proud to be part of that long heritage! When you visit Alpine Helen, you will feel as though you have taken a step back through time. This quaint area is fashioned after an old world German Alpine village. The cobblestone alleys and winding towers will make you feel as though you have left the states. Here, you will also be able to enjoy a wide variety of shopping, dining, and entertainment. This charming area is always celebrating something the whole year long. There are fourth of July festivities and the Bavarian Nights of Summer. An annual hot air balloon race is fun for the whole family. Winefest is another favorite. For a winter wonderland, be sure to check out Alpenfest which kicks off each Thanksgiving and runs through December. The most popular of Alpine Helen's festivals, to be sure, is its Oktoberfest. This celebration of German culture is the longest running of its kind in the south. You will enjoy authentic German food, parades, drinks, and live entertainment. Who says a small town has to be dull? For the perfect small town feeling vacation that will offer you and your entire group something fun to do, a cabin vacation in Helen is just what you need. Here, you will find the perfect blend of fun and relaxation. Slow down for a while and enjoy a vacation that really gets you away from it all. If you have ever passed through a small town, you know how charming and peaceful they can be. The idea of vacationing in a small town, however, never seems to cross our minds. Part of that whole small town appeal is the simplicity of it all. What could be more simplistic than being one with nature? Whether you are on a family vacation, a romantic getaway with your sweetie, or a fun trip with friends, the whole group will be able to enjoy the peaceful, back-to-basics environment around your cabin. Nothing could be more relaxing than an afternoon of floating lazily down the Chattahoochee River on a tubing adventure or spending the day on a serene fishing trip. You can plan a day hike that will lead you to majestic waterfalls and allow you to explore the plants and wildlife of the forest around you. You will truly feel that you have gotten away from all of the madness of everyday life and stepped into a simpler, quieter world. Floating down the Chattahoochee River. Hiking to the famous Anna Ruby Falls, a double waterfall, as one of many hiking locations. Participate in one of the many festivals each year, especially Oktoberfest. Take a carriage ride through the rustic, old-world streets. Go horseback riding through the forest. Golf, shop, dine and so much more! Helen is a special place. Its history reveals a constant recognition of the beauty of the landscape and the integrity of the people. As a haven for vacationers, the Alpine village of Helen has over 200 establishments, consisting of gift shops, specialty stores, galleries, and restaurants. Besides its amenities, Helen offers memorable festivities throughout the year. It holds various events like the Winefest, the Hot Air Balloon Race and Festival, Volksmarch, and Independence Day fireworks. Music enthusiasts also flock to Helen for the three-month-long Oktoberfest (which runs from September to November). Christmas parades, the Alpenfest, and the Christkindlesmarkt (Christmas market) are organized during the holiday season. 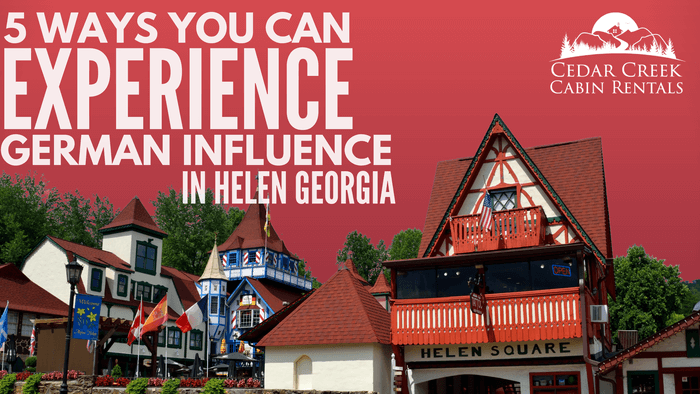 Moreover, tourists can drop by the Helen Arts & Heritage Center, Helen Amusement Park, Charlemagne's Kingdom, Dukes Creek Gold and Ruby Mines, Nora Mill Granary, Habersham Winery, and the Folk Pottery Museum. They can also spend time at Lake Burton, Unicoi State Park, Chattahoochee National Forest, and the Black Forest Bear Park. Aside from shopping and sightseeing, Helen visitors can experience more outdoor fun by canoeing and river tubing on the Chattahoochee River. They can also hike at the Brasstown Bald Mountains. Golf lovers can play at the Alpine Helen Mini-Golf or at the Pirate Cove Adventure Golf. They can likewise go horseback riding, camping, and fishing in nearby forests, rivers, and waterfalls. At the end of a busy day, tourists can relax in their luxury cabin, reflecting on a beautiful and fun-filled day! No matter how much time and effort you put into planning for your vacation, there will always be elements that are out of your control. How can you know what the weather will be like before you leave for your trip? 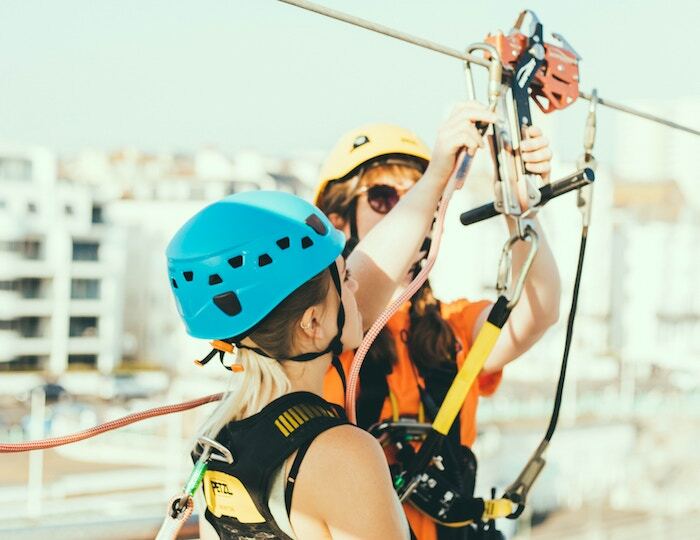 On getaways to the beach or a large outdoor attraction, your plans can be easily foiled by mother nature, leaving you trapped inside your hotel. Flexibility is just one of the greatest advantages of staying in one of our cabins. Helen is full of fun and exciting things to do both outdoors and inside, so you can have a great vacation rain or shine! Even when it's raining outside, you don't have to stay confined to the cabins. Helen offers plenty of great indoor activities like painting your own pottery at The Willows Pottery in Nacoochee Village. Stay warm and dry as you bring out your creative side and make your own custom work of art. You can choose from a wide variety of pottery types to decorate for your self including mugs, bowls, casserole dishes, wine coolers, tiles, plates, goblets, and more! No appointment is necessary, so you can make plans for you and your group to come in, or simply stop by on the fly. The professionals at The Willows Pottery will fire your pieces and you can either pick them up in two weeks or if you are heading home sooner, your custom pottery can be shipped to your home. In addition to the gold rush, there is so much more history to be discovered near your cabins. Helen is loaded with rich culture and a visit to the Sautee Nacoochee History Museum will reveal some of the areas interesting past to you. The museum features numerous artifacts which were recovered from the Helen area. You will learn all about the fascinating history of the Cherokee Indians who once inhabited the area. As you pass through the museum, you will be transported through time all the way to present day Sautee Nacoochee. 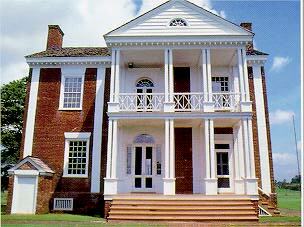 Visiting the Georgia Heritage Arts Association is another great way to spend your time. Helen is home to this cultural hub which has been operating for over twelve years. Here you will enjoy a wide variety of exhibits created by local Georgia artists. The Gourd Place located in Sautee is also a fun place to stop for local art. Creative energy is channeled into beautiful crafts and works of art. You will see all kinds of wonderful pieces crafted from gourds including dolls, rolling toys, plant holders, calligraphy gourds, masks, ornaments, drums, and so much more! The Gourd place features a museum and a retail shop so that you can take some of these delightful pieces home with you. Near Helen is an adorable day trip destination by the name of Nacoochee Village. This charming village will allow you to spend some time in "civilization" without the hustle and bustle of big city chaos. For the shoppers in the bunch, there are plenty of opportunities at Nacoochee Village's many boutiques and antique stores. You can watch the potters at work, or join in at the Willows Pottery. For a day of wine tasting, try Habersham Winery. And for those looking for some friendly small town advice on river activities like boating and fishing, stop at Unicoi Outfitters. They can teach you everything you need to know and set you up with the equipment you need to do it. Why do you come back to Helen year after year? Is it the fall foliage or hot air balloon races? Maybe you are drawn by the longest Oktoberfest celebration in the world. 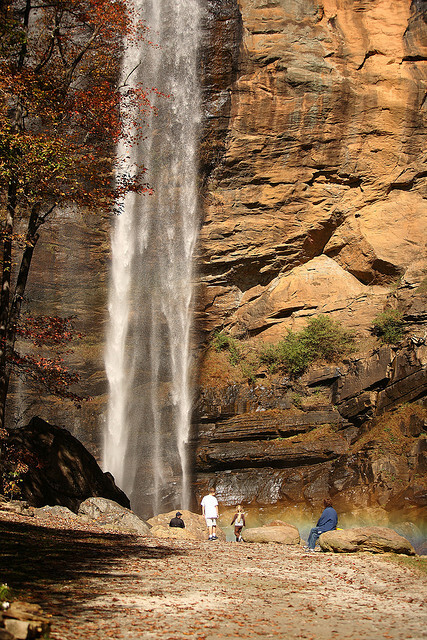 Helen has become a top tourist destination in Georgia for several reasons including its history, charm, proximity to recreational activities and local culture. Vacation is all about rest and relaxation, so why not pamper yourself while staying at our cabins? Helen is located near to the Nacoochee Crossing Wellness Center where you can receive massage and spa treatments that will bring you to a state of total serenity and relaxation. One of Nacoochee Crossing's most popular packages offers a full hour relaxation massage followed by an anti-stress facial and a citrus body polish. Who's to say that you can't have a great time inside the cabins? Cabins with luxury amenities are perfect for families, couples, or groups of friends looking to have fun - rain or shine. Even if the weather is less than ideal, you can still enjoy your time together playing on game tables, watching a movie on your big screen TV, cooking a romantic meal, and so much more. And you can relax even further with your own private hot tub or Jacuzzi bath. What appeals to you most about a visit to Helen? What is the most relaxing part of a Georgia mountain vacation to you? Please feel free to share your thoughts with us in the comments section of our blog. Do You Know Answers To These Ten Oktoberfest Questions? Fall has arrived in northern Georgia, and that means that visitors are flocking to the area to celebrate Oktoberfest Helen! Hoist a pint, join the parade and eat a brat when you head to Helen this fall. Oktoberfest in Helen is the longest running Oktoberfest celebration in the world and starts in mid-September running through the end of October. There is nothing quite like experiencing the traditional German fall festival and celebration in Helen. What you find at the Oktoberfest in Germany is what you’ll find right here in Helen Gerogia. Oktoberfest has been a staple of Bavarian culture for more than 200 years. 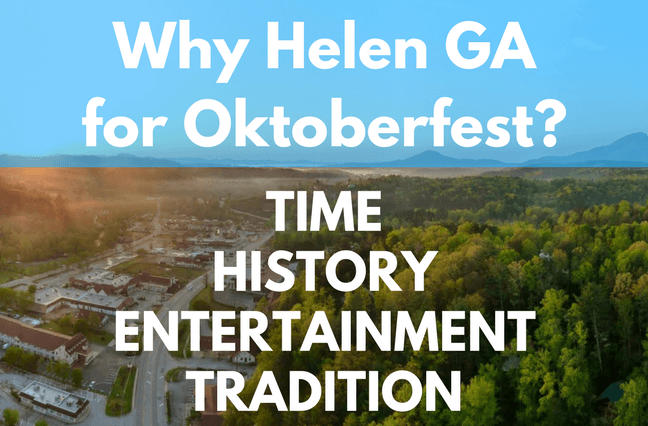 There is no better place to celebrate this tradition than Helen, Georgia, home of the longest Oktoberfest celebration in the world. When you're driving up Georgia's I-75 into the scenic north Georgia mountains, the last thing you might expect to see is a German Alpine village. Known for its charming Bavarian culture, Helen is truly a place like no other. But how did this city come to be in the middle of the Chattahoochee National Forest, anyway? And how can you experience the rich German heritage during your next visit? Here's your guide to the village's history, and all that there is to see and do. Georgia is full of natural beauty and wonders. As you travel through the north Georgia mountains you can step into picturesque places that will take your breath away. Here are the magnificent natural wonders that are awaiting you in Georgia. Choosing Helen Georgia is a perfect vacation option regardless of the season. There's a wealth of exciting adventures and amazing recreational opportunities awaiting guests in the mountains of North Georgia. Regardless of whether you are planning a romanic getaway for two or a full-blown family reunion, one of the biggest challenges associated with organizing a trip is finding the right accommodations. 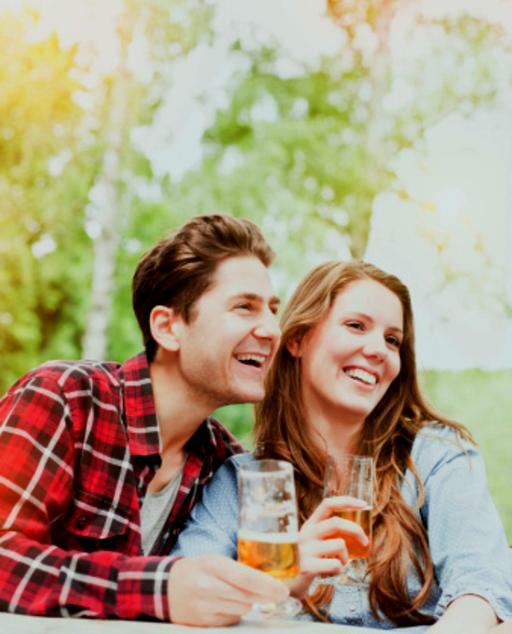 How will you find the perfect spot that will provide a fun and luxurious atmosphere for the whole group that will also meet the individual needs of everyone? 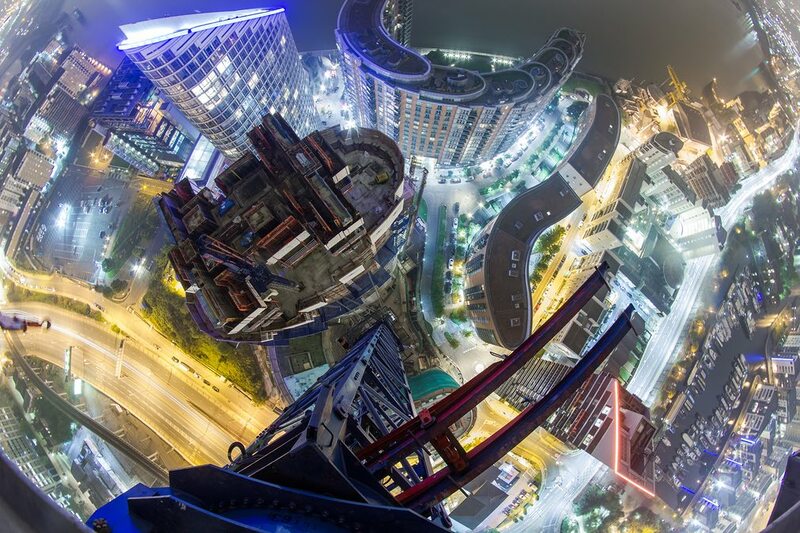 Have you ever wanted to feel like you are flying through the air? Have you imagined feeling the wind across your face and watching the scenery behind you disappear as you sail across the landscape below? Unfortunately, most people keep their feet on the ground and miss fulfilling the fantasy of flight. We live in a fast paced world where everything around us is always changing. So in a society where everything is constantly shifting, where can you go to get back to the roots of everything and connect with the past?